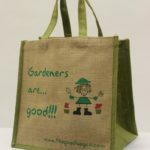 The Good Bag Co was founded in 2006 by Alan and Lesley after seeing so many plastic bags discarded and dumped and damaging the local environment and wildlife. They decided to create an alternative which would be practical and enjoyable to use. Their bags are made from eco friendly jute and the lining which makes the bags water resistant is biodegradable. The inks are water based too. Alan injected his wicked sense of humour into the vivid designs and characters you can see on the bags and between them they developed the business into the successful brand it is today. Unfortunately Lesley passed away in 2013, so The Good Bag Co has been a little quieter, but due to Alan’s resilience and dedication to Lesley’s memory and what they had built together the company is now firing on all cylinders and ready to bring the public some bright new bags. As well as buying online you can visit The Good Bag Co shop in Grasmere, Cumbria and also visit their stall at the Manchester Christmas Markets. Name two animals featured on their bags from their animals and wildlife collection? Closing date for entry will be November 1st. After this date no further entries to the competition will be permitted. There is no entry fee and no purchase necessary to enter this competition. No responsibility can be accepted for entries not received for whatever reason.The winner will be chosen at random and notified by email and/or letter within 28 days of the closing date. Any personal data relating to entrants will be used solely in accordance with current [UK] data protection legislation. The promoters of this competition are The Good Bag Co & GreenFinder and data will not be disclosed to a third party without the entrants prior consent.